A trio of Alberta communities are welcoming back a pioneer symbol of hope and prosperity that gripped early settlers across the western landscape more than a century ago. Benalto, Beiseker and Scandia are restoring old Canadian Pacific train stations to their former glory. They hope the icons will revitalize their communities with additional public services and increased tourism dollars. The west-central Alberta hamlet of Benalto reclaimed its train station, originally built in 1928 and moved out to the Red Deer area in 1971, to become the centrepiece for its 100th anniversary celebration next June. 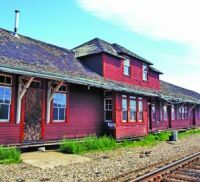 Beiseker purchased the 102-year-old Bassano station and hopes to have it ready in 2014 as its new museum for western Canadian railway equipment. Scandia has turned the 103-year-old dilapidated Jenner station into a theatre and gathering place at the hamlet's historical park. Benalto's original modest centennial plans were dramatically changed a year ago when Red Deer's Garett and Brenda Cupples offered to give back the station for free. "How do you say no to that?" said Dave More, chair of the hamlet's centennial committee. But while reclaiming the station came at no cost, there was a price to move it. An even bigger question was where would the committee put the 64x22-foot two-storey relic. That was answered quickly when Benalto's Bill and Dale Speight, owners of the town's former CP Rail lands, donated green space near Main Street. The committee, helped by a successful media campaign, then quickly raised the necessary $32,000 to move the station 37 kilometres from Red Deer to Benalto. On April 24, the station was brought home. A crowd of up to 300 citizens gathered in Benalto to welcome the return of its station. "They brought it from the west end, through the trees and led by five young women on horses," said More. "There was not a dry eye on the whole street. It was quite an amazing moment." More is hoping the station, which will undergo extensive renovations this winter, will at least be partly ready for the June centennial celebrations. Ultimately, the site for the icon will be renamed Centennial Station Park, a gathering area for the hamlet and symbol of renewed prosperity. The Benalto station was moved to the hamlet from Red Deer in 2013 to a large green space, the hamlet's former CP lands, which will ultimately be renamed Centennial Station Park. While the hamlet was welcoming its original station back, officials from the Alberta 2005 Centennial Railway Museum Society in Beiseker had eyes on another community's pioneer icon -- the huge 162x20-foot Bassano station. After several years of planning, the central Alberta historical society secured the station in a bidding war for $10,000. Last July, it was moved 155 kilometres to the village over two days and placed south of the old Beiseker station, which houses the village's office and museum for local history. While there are great expectations for the new museum, society officials still have to do extensive renovations and solve a high water table problem at the site. Even still, they hope to have the new museum at least partially open by spring. "We have a lot of interest. We actually have a lot of CP people that at one time or another did work in the Beiseker area," said society treasurer Fred Walters. "It's going to mean quite a bit. The good part is that it's going to increase our tourism." Beiseker acquired the Bassano station after outbidding Scandia's Eastern Irrigation District Historical Park. When Beiseker officials were bidding on the Bassano station, they were up against the hamlet of Scandia's Eastern Irrigation District (EID) Historical Park. Scandia, located 34 kilometres southwest of Brooks, did not get the Bassano landmark but in early 2011 park officials heard the old Jenner station, lying derelict in a farmer's field for more than 40 years, was available. "It was in very bad shape when we got it," said park president Rosalind VanHal. "The owners said they thought the people who owned it before them had plans to fix it up and live in it. It never happened. It just stayed there." The park acquired it in exchange for $10,000 worth of tax receipts. With the help of a $230,000 provincial grant and another $70,000 from the EID, the park was able to move the 24x24-foot two-storey Jenner station 115 kilometres to Scandia and then restore it. The old station, which sits in the shadow of the "Sleeping Giant" -- a preserved 1920s-era Alberta Pool Elevator -- now houses a 27-seat theatre, a venue that will soon feature a film on Carl Anderson, one of the pioneers of the EID. "It is beautiful. Everybody in the community says the same thing," said VanHal, adding renovations are still required for the station's second floor. "Everybody who comes through is amazed at what we've accomplished."